Is weight obsession an eating disorder…..? Anorexia nervosa. Bulimia nervosa. Binge Eating Disorder. Familiar words right? The actual definition of an eating disorder is: any of a range of psychological disorders characterized by abnormal or disturbed eating habits. What’s an abnormal or disturbed eating habit? Eating disorders are often associated with extremes – super skinny anorexics who are walking bones desperately in need to eat. Or someone who on the outside looks ‘normal’ (whatever that means) but stuffs herself with anything she can before throwing up in the secrecy of the bathroom hoping that no-one knows. Or with binge-eating disorder a person loses control over his or her eating but unlike bulimia nervosa, periods of binge-eating are not followed by purging, excessive exercise, or fasting. So is it possible to be so obsessed about weight, in an extreme way, that actually this could be termed as an eating disorder too? 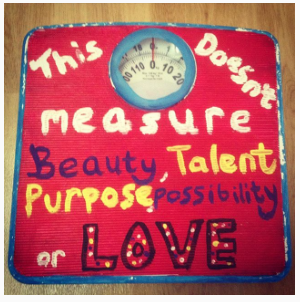 Do all eating disorders have weight obsession as a factor? Do they all have control as a factor? For someone who personally struggled for over a decade with undiagnosed eating disorders, I know for many of you reading this, on first glance, you might think that isn’t you but let’s look at this closer. Someone with an eating disorder has a dysfunctional relationship with food. It’s disordered eating. It’s about counting calories. Measuring food. Weighing grams. It’s about restricting, denying, depriving and controlling. For many it’s about weight management. It’s about control. It’s about taking all of these measures to the extreme. Others may sporadically count calories or exercise a little bit more in preparation for whatever special occasion is a few weeks off which they feel like they need to lose weight for (we’ve all done it). Some, however, have a tendency to give it their full, undivided, obsessive attention. So when does weight obsession verge on becoming an eating disorder? When obsessive thoughts take over your mind? When you cannot go places and accept invitations in fear of it ruining your diet? When you can’t relax and have fun with your family as you are planning your daily food allowance in our head? When you stop living and allow weight obsession and food obsession to be your entire life’s focus? When your soul purpose of being here, of living, is to be slim? If you fixate on your weight at the expense of living your life, believing that the smaller the number on the scale the more your life will become a shiny bed of roses sprinkled with fairy dusk and a rainbow, is that not disordered eating? Is that not an eating disorder? I think it is. Actually I truly believe it is. You don’t have to be on the verge of death through starvation or be consuming 10,000 calories in one sitting before throwing up to need help! If your life right now revolves around your weight in any of the ways I mentioned, I encourage you to STOP, take a step back and reach out for help if you need to. I needed help for over a decade. I needed someone to sit me down and tell me that what I was doing to myself, to my body was not normal. I needed someone to tell me that counting calories and writing lists of what I had eaten is not what ‘normal’ eaters do & it was totally f*cked up. I needed someone to explain to me that weighing myself at least once a day was not how someone who loves themselves or accepts themselves does. I needed someone to hug me, support me, guide me back to my truth, to who I was. I needed someone to take me home to my soul, to my purpose, back to me where weight was not what defined me any longer. When weight obsession becomes your definition of who you are as a person, it’s time to step back and ask yourself whether you can go on like this for any longer or whether it’s time for you to start changing stuff, addressing stuff and getting the help and support you need. You aren’t alone by the way. There are hundreds of thousands of women right now on their knees, praying for a miracle to help them reduce their weight, in the meantime life is passing them by. You are that miracle. You have all the answers. You just don’t realise it yet.